Yesterday Sunday 26th August we drove from Gallup New Mexico to Amarillo, we had a walk around Albuquerque as we looked for the hard rock café for Bethan to pick up a glass for her collection only to find it was 14 miles out of town, so we drove there so that she could get one expecting that they would have a hard rock café where we could stop for lunch but in the hard rock hotel they don't have one!!! So we just drove a bit more, at Tucumcari we had to stop so that I could go to the bathroom but other than a gas station there wasn't much there- we found lots of places were closed and shut up- we think this is because we have hit 'America's bible belt' and because of it being Sunday not much was open. At about 5pm we arrived in Adrian which is the midway point on route 66 and it was pretty cool to get photos of the midway café although that closed just an hour earlier, our body clock however was still in mountain time and it was 6pm there but we adjusted our clocks possibly for the last time and we are now 6 hrs behind the UK. I spent a long time in the car today playing on Railroad USA trying to beat the high score Bethan had set- I blew it out of the water eventually getting 270 as my high score- I am so proud of myself. After visiting Adrian we hit the road again and headed for Amarillo- we were all ready to kill Bethan as she had been singing show me the way to…. Pretty much all day it was so annoying and we even contemplated putting sleeping pills in her water to stop her from singing- but we eventually arrived. 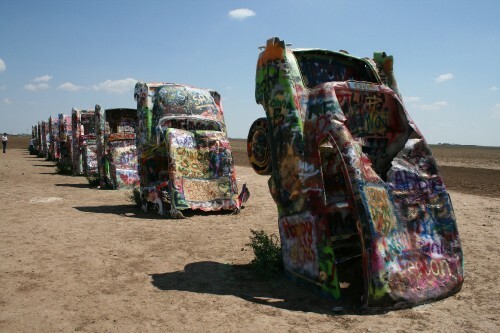 We visited the Caterlack ranch and all took part in making our mark on the cars with the spray cans around- we just couldn't believe there was no charge to enter or spray paint on the cars- it was pretty cool and I'd advice anyone to check it out and have a go. We checked in to a much nicer hotel than the previous night as it didn't say triple bolt you door, the receptionist was really friendly and suggested that we had food just down the road at a restaurant called Hoffbrau it was a steak house and the food was amazing, Mam had a 8oz steak which was 4 times the 8oz steak that we would get in the uk- we also tried their signature thin fries which were peppered crisps but were amazing. The waitress loved how we called them crisps and I really loved how she kept saying ya'll ok? We had a fantastic meal and were surrounded by people wearing Stetsons and wearing boots with spurs on them if any of you are heading to Amarillo go to the Hoffbrau you wont regret it!